Richard Falk once again captures our attention with a nuanced analysis of what we need to do - at the personal level as well as state actions - to refocus our pursuit of human rights in a post-9/11 world. From democratic global governance, to the costs of the Iraq War, the preeminent role of the United States in the world order to the role of individual citizens of a globalized world, Falk stresses the moral urgency of achieving human rights. In elegant simplicity, this book places the priority of such an ethos in the personal decisions we make in our human interactions, not just the activities of government institutions and non-governmental organizations. 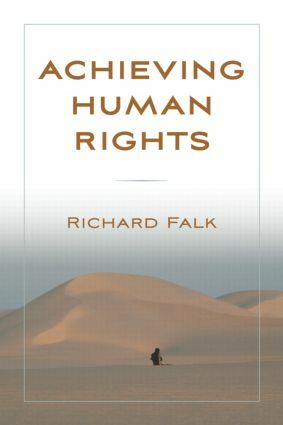 Falk masterly weaves together such topics as the Iraq War, U.S. human rights practices and abuses, humanitarian intervention, the rule of law, responses to terrorism, genocide in Bosnia, the Pinochet trial, the Holocaust, and information technology to create a moral tapestry of world order with human rights at the center. The Power of Rights and the Rights of Power: What Future for Human Rights? The Pinochet Moment: Whither Universal Jurisdiction?